renovate the roofline of iconic Notre Dame cathedral after a fire gutted the oak-beamed structure and sent its 300-foot spire crashing into the nave, Prime Minister Edouard Philippe said, here on Wednesday. The international competition will allow us to ask the question of whether we should even recreate the spire as it was conceived by Viollet-le-Duc. Or, as is often the case in the evolution of heritage, whether we should endow Notre Dame with a new spire. This is obviously a huge challenge, a historic responsibility," Philippe said after a cabinet meeting. Philippe said they hoped for "a new spire that is adapted to the techniques and the challenges of our era". No estimation of the cost of rebuilding the cathedral, for which French billionaires, multi-nationals and private citizens had raised 880 million euros, had been done, he said. 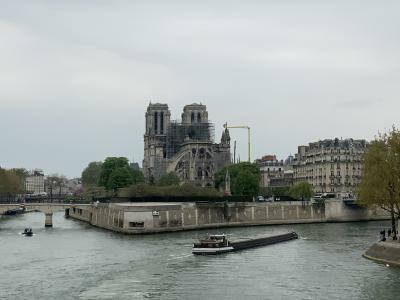 The government would present a bill next week to ensure "transparency and good management" during the mammoth reconstruction project, including measures to make sure all donations actually end up going to Notre Dame, he added. Ordinary French citizens will benefit from a tax break of 75 per cent on donations up to 1,000 euros. The spire was destroyed in the flames that tore through the 850-year-old Gothic building's roof. According to officials, the entire cathedral was minutes away from total destruction. However, much of the building, including its famed towers, survived. Now the focus is on how to reconstruct what has been lost. In a televised address on Tuesday, French President Emmanuel Macron said he wanted it rebuilt by the time Paris hosted the Summer Olympics in 2024. "We'll rebuild Notre Dame even more beautifully and I want it to be completed in five years," said the President. But experts considered the timeframe "impossible". Experts say the cathedral's reconstruction could take decades and involve substantial challenges. The main problems in rebuilding the cathedral, include sourcing of materials, and painstaking work to preserve elements of the church that survived the fire but might have been badly damaged by it, the Guardian reported. As the Paris prosecutor's office said investigators looking into the causes of the fire were still not able to inspect inside the cathedral, Notre Dame's rector Bishop Patrick Chauvet said he expected the building to remain closed to the public for five-six years. A fire service spokesman said there was no immediate danger to the structure. But it was not yet considered secure enough for investigators to enter and start examining the source of fire in situ, the prosecutor's office said. Investigators, who said they had no reason to believe the blaze was anything but an accident, spoke to about 30 witnesses on Tuesday, including employees of companies involved in a 150 million euros restoration programme that started last year and was widely believed to be linked to the fire. Architects identified three main holes in the structure where the spire formerly stood, in the transept and the vault of the north transept. But a Paris fire service spokesman Gabriel Plus said on Wednesday the cathedral's renowned rose windows were in good condition. Statues inside the gables had been taken down as a precautionary measure to reduce the load on the structure, Plus said. The spire's bronze rooster, a symbol of France, was found on Tuesday, deformed by the heat and battered by its fall but nonetheless recognisable. Many other priceless artefacts inside the cathedral were also saved, including the Crown of Thorns, seen as Notre Dame's most sacred relic, and the cathedral's famous 18th-century organ that boasts more than 8,000 pipes. Some paintings and other art works will be restored at the Louvre after suffering smoke and water damage. Stephane Bern, the government's culture representative, said on Wednesday 880 million euros had been raised for the restoration, with contributors including Apple, the Total energy group and tycoons who own luxury French brands such as L'Oreal, Chanel, Dior and Louis Vuitton. Many private individuals in France and around the world also donated.